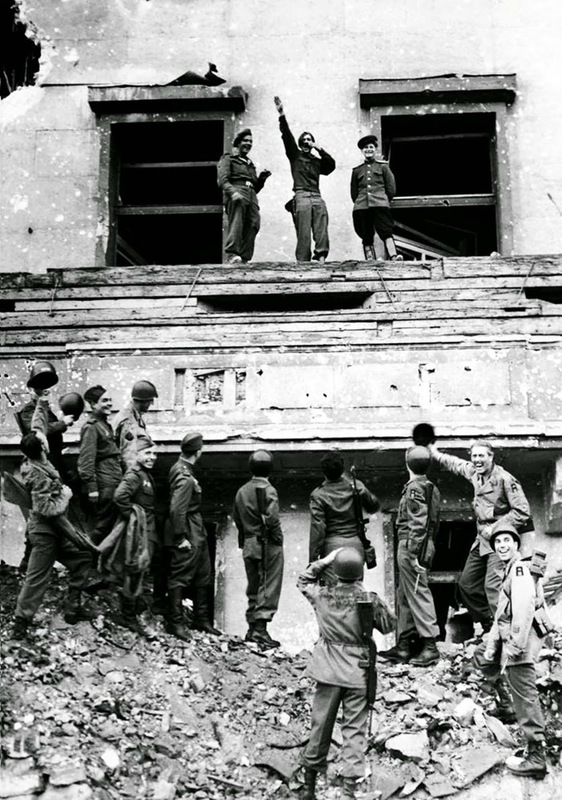 Soldiers of the British, American and Russian armies mimic and mock Adolf Hitler and his ideas on Hitler’s famous balcony at the Chancellery in conquered Berlin. The Russians were coming from the East, the Brits and Americans from the West, all with the objective of taking the Chancellery, knowing that would signal the end. So when they both finally met there, and the Nazis were irrefutably vanquished, they must have felt ecstatic. You can barely imagine what those men have gone through, and how many times they have nearly been killed or had to kill others to get there. Just think of the relief they must feel to be standing there knowing that it is over. The picture depicts Corporal Russell M. Ochwad, of Chicago, playing the part of Hitler on the famous balcony of the Chancellery, in Berlin, from which the former Nazi leader had proclaimed his 1,000-year empire. A British and Russian soldier stand on each side of Cpl. Ochwad, while American and Russian soldiers cheer at the little get-together. The soldiers on the bottom are mostly Americans, the round helmets and M1A carbines are enough for that. There are three Russians as well, in the high boots and pilotka caps. The “A” on the shoulders on the right (two soldiers) is a shoulder patch which indicates they are a soldier of the U.S. First Army. The photo was taken by Fred Ramage on 6th July, 1945 (about 2 months after Germany’s surrender, 1 month before Hiroshima and the day after the Philippines were liberated). 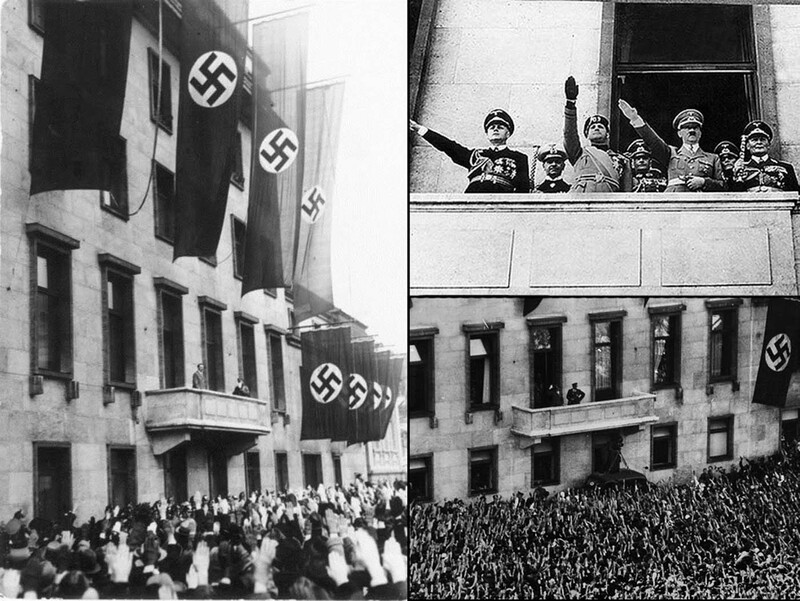 Hitler standing on the same balcony. The building itself was called the “neue Reichskanzlei” (New Chancellery). In late January 1938, Adolf Hitler officially assigned his favorite architect Albert Speer to build the New Reich Chancellery. Hitler commented that Bismarck’s Old Chancellery was “fit for a soap company” but not suitable as headquarters of a Greater German Reich. The Russians got 1st to wipe the nazis out of their capitol Berlin. The Western allies did a lot, but they didn't Battle to meet the Russians at the Chancellery. This is a later photo op, the only ones shooting nazis out of the Building are Stalin's men.